When word surfaced last year that Austin-based Japanese phenomenon Uchi had signed a lease on a space in Dallas, Eater mused "that the Twitterverse and blogosphere understandably went a little nuts." 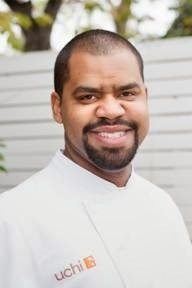 Uchi showcases the culinary talents of executive chef and James Beard Award winner Tyson Cole. His exciting menu expands on the Japanese tradition with new flavors and innovative food combinations that ensure a unique dining experience. Cole opened his second restaurant in Austin, Uchiko, in July 2010 and celebrated the release of Uchi the Cookbook in March 2011. His third restaurant, Uchi Houston, opened in 2012. Cole looks forward to opening Uchi Dallas in early Spring of 2015. According to D's SideDish, "The dining room will be the largest of the three locations, seating a few more than the 200 who can fit inside Austin’s Hyde Park alcove of Uchiko. The Dallas restaurant, situated at the corner of Maple and Randall near the Stoneleigh Hotel, will have a patio." Chef Nilton “Junior” Borges, Jr.
Today, Uchi Dallas announced that Chef Nilton “Junior” Borges, Jr. will join the team as Chef de Cuisine for the restaurant. Originally from Rio de Janeiro, Junior brings a unique background of fine dining from Michelin rated restaurants in New York City. Joining the Uchi family in 2014, Borges will lead the team at Dallas, along with James Beard award-winning Executive Chef and Owner Tyson Cole. Guests can expect the Japanese fare they’ve come to love from the Uchi team, while introducing surprising new flavors and influences from around the world. “After working in New York City for thirteen years, I’m looking forward to calling Dallas home,” notes Borges. “I’m excited to focus on seafood while creating inspired combinations of flavor, texture, color, technique and style.” Borges moved to the United States without culinary experience and speaking only his native Portuguese. Unable to pay for culinary school, Borges taught himself English by devouring cookbooks and watching television shows on The Food Network. Working his way through and up the ranks of various New York City kitchens, Borges received official culinary training at the International Culinary Center while working as a lead line cook at Tom Colicchio’s eponymous Colicchio & Sons. From there, Borges perfected his own distinctive style as the executive chef at Amali, where he crafted dishes with the freshest ingredients of the season. While in Houston for a work trip, Borges made it a point to dine at Uchi and meet the culinary team. Within a few months, Borges relocated to Texas to join the Uchi family. Set to open sometime nearly Spring, Uchi will be located in the Arts Center, a stone throw from the Stoneleigh Hotel, on the corner of Maple Avenue and Randall Street at 2817 Maple Avenue. For more information, visit http://uchiaustin.com.